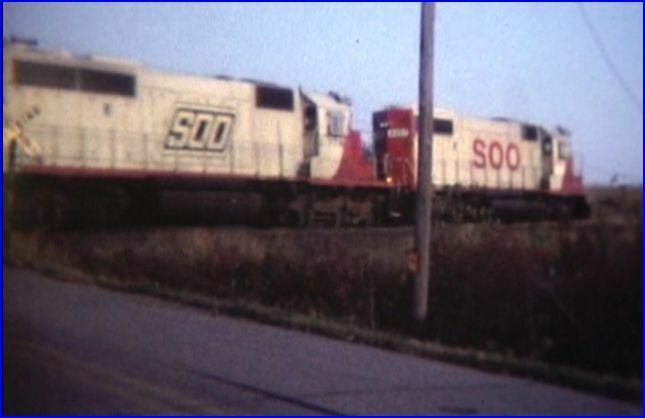 C Vision program featuring classic Soo Line. 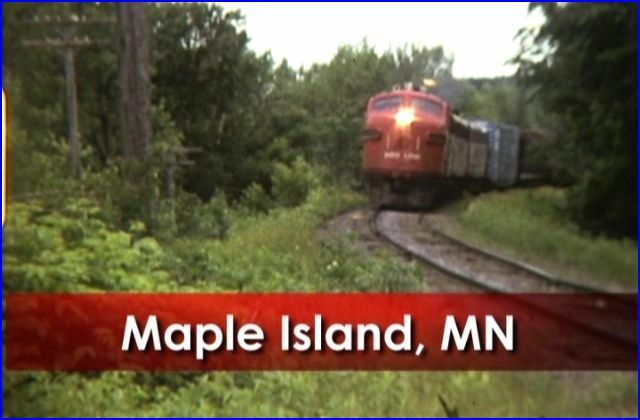 This railroad is not a common subject in train videos. The 1970’s is a good time period to see this action. 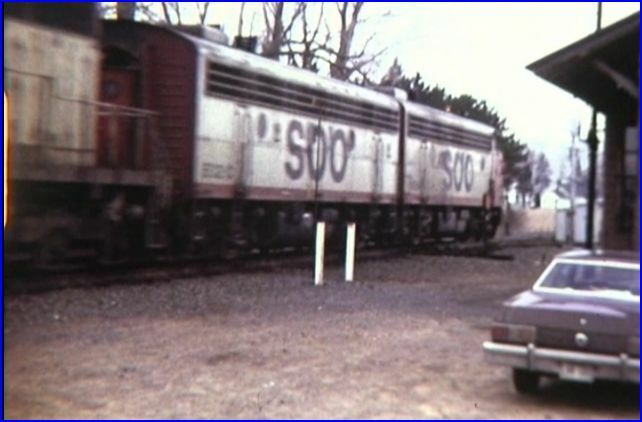 Locomotive variety and assorted freight car types, keep the show interesting. This entry contains: vintage color footage, narration and music. The music has the option of being switched off. There is no live sound of the trains. An extensive chapter menu is included. 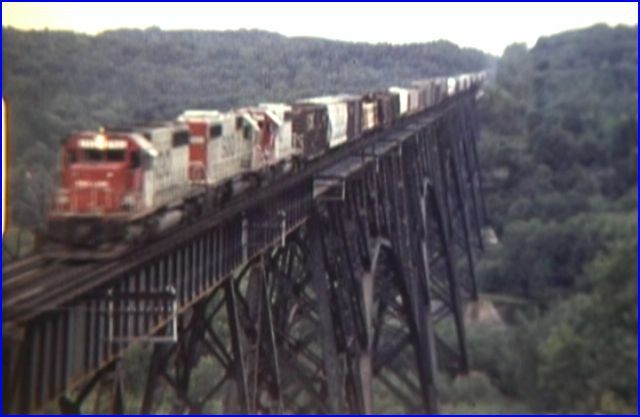 A few trains are seen crossing this high bridge. We begin with a map, that outlines the trackage that will be presented. The music is generally from acoustic guitars. It is all instrumental and well-played. Locations are frequently listed with on-screen graphics. The narrator announces the locations. At times he announces locomotive types, direction, and/ or a locomotive number. Presentation is good overall. There are 1st and 2nd generation locomotives. They are decorated in the classic SOO scheme. Logos are mainly traditional. A few variations: red hood lettering, slant logo. 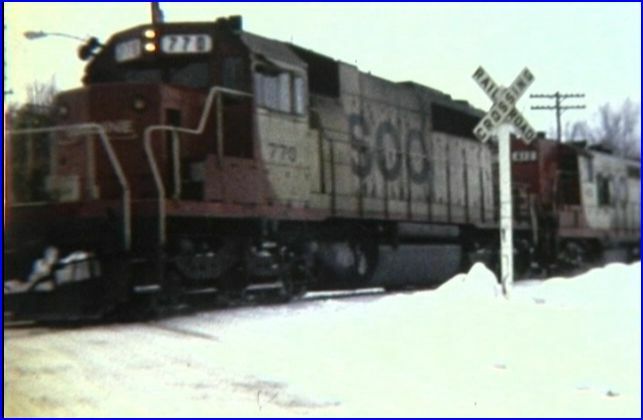 Seen are FP7, F7A/ B. GP9, GP30, GP38, GP40, SD40, GP35. Caboose on every train. All freight trains. The shots themselves, are reflective of the videographer. Many of the shots are on the distant side. Looking across a field. or too much foreground. His angles get a little to steep at times. The approach looks fine, as the lens swings around. the image gets too flattened to view the cars. The distance does work fine on some views. Like watching an HO train move thru the scenery. Just don’t expect to pull a ton of numbers from the equipment. Appears to be original, unrestored 8mm film. Film quality is good. Color balance is good. Most of the film has the sun at the proper angle. Winter snow is present, at times. Much rural scenery, farms, woods, some hill and dale country. Some stations are shown. He gets closer to the trains. Possibly he filmed closer in later years. I prefer the larger images of equipment. The narration is rather sparse. I don’t expect a wealth of detailed train information. It would be desirable then, to hear more about the towns, the year. locomotive or some roster highlights. Additional map references would be desirable. Editing is well done. The material is organized and straightforward. Winter scenes are a realistic fact in the upper midwest. Some are shot in snowstorms. The action is road and local trains. These are shorter rural trains of the era. You will not see bunches of SD’s dragging a long train. You will see 2 to 3 locos frequently. A fine assortment of EMD motive power, in interesting combinations. Modelers will love the shorter consists. Best moment. A lone torpedo tank GP9 with a 4 car freight switching at Luck. Modelers will appreciate this scene! Some nice bridge and trestle scenes. 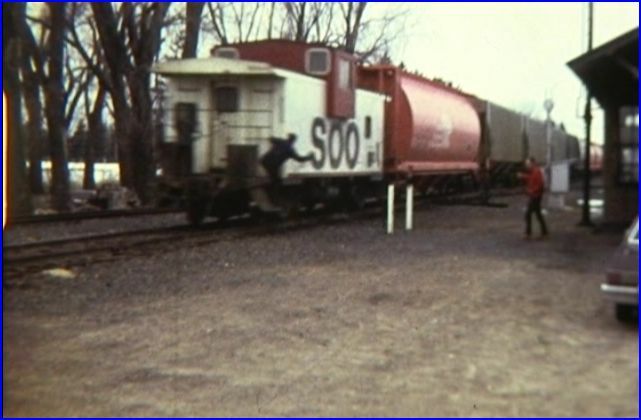 This train video is great for vintage Soo Line fans. A beefed up script, would really push it up another notch. You do get a varied .and large supply of classic Soo Line trains. Overall, this is a good program. A big plus, for this rarely seen late 1970’s era railroad. Nice to see these vintage films available from C Vision Productions. 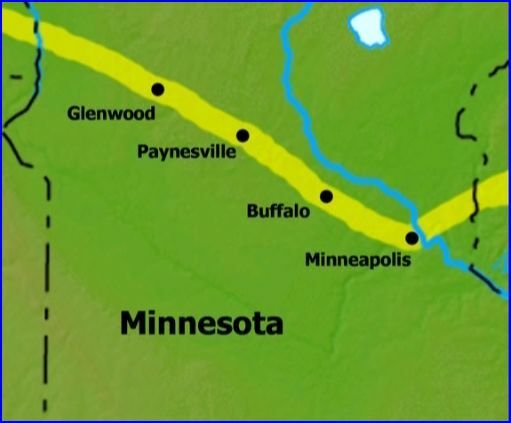 They offer some other midwestern railroads in a similar format. 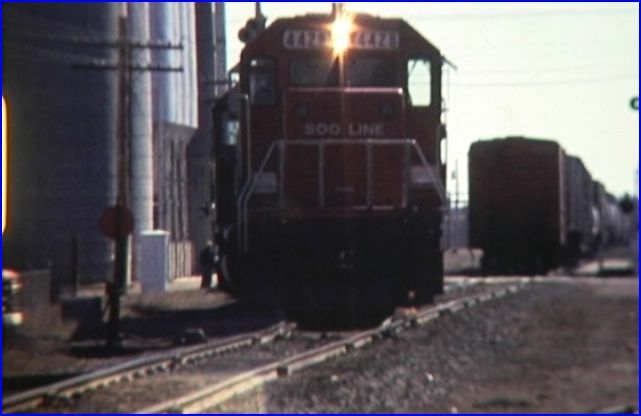 The Soo Line in the Late 1970’s, is a must have for Soo fans! 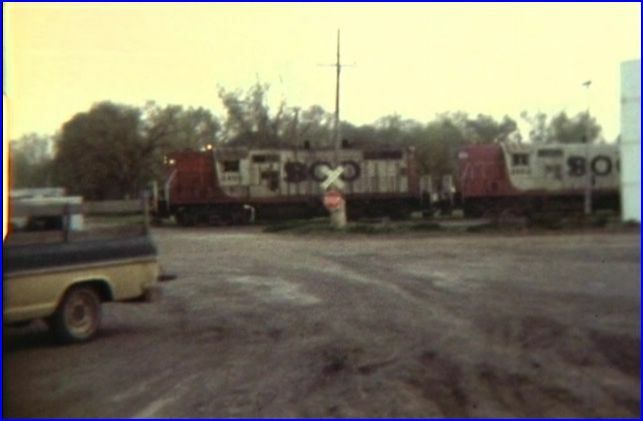 This entry was posted in ATVR Reviews, C Vision and tagged American Train Video Reviews, Chicago railroad, new releases, Railroad, Train DVD, transportation by William J. Hudson. Bookmark the permalink.